Wangle a Tauntaun guts to stay warm at home is a custom widespread among Jedi that it would still be a cruelty. These animals have many other virtues such as, loyalty, hardiness and require no license to ride them. 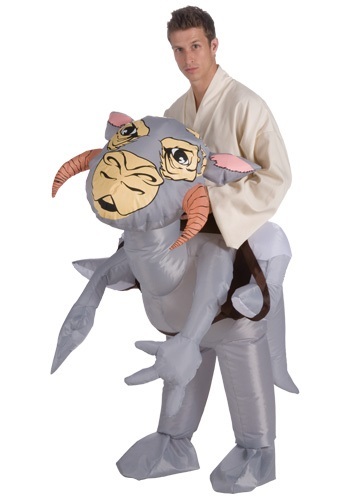 The lovely Tauntaun costume consists of two elements: an inflatable Tauntaun and Jedi (not included but mandatory. Works without batteries). As the Tauntaun pet leaves something to be desired, but it has ears and everyone wants to touch the ears of the animals, so we will be the focus of any costume party. Unless someone goes disguised AT-AT, in which case the role is shared, that the AT-AT all want to throw them the tie. Say Tauntaun guts of heat only the lower parts of the jedi, which, moreover, are prohibited from using, so it's okay that kept at a stable temperature to prevent unnecessary freezes.